When watching Disney’s “Treasure Planet” today, it’s hard to believe the movie has just reached its 10th anniversary – not because it feels new, but rather quite the opposite. 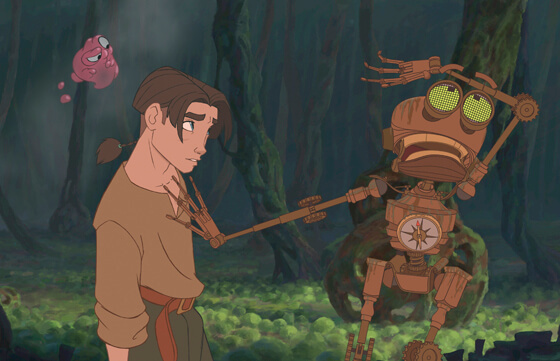 While “Treasure Planet” is enjoyable to watch, it plays like a product of the ’90s. With dated computer graphics, artistic style, and soundtrack, the film’s release to Blu-ray entertains but reminds audiences why it never became a Disney classic. “Treasure Planet” is based on Robert Louis Stevenson’s “Treasure Island,” spun into a sci-fi world of the future with space pirates, aliens, laser guns, and automatons. With legendary Disney directors John Musker and Ron Clements at the helm, this film appeared to be a way for them to take animation beyond the worlds of princesses in “The Little Mermaid” and “Aladdin,” appealing more to a male audience. But while the adventure of the film is often exciting, there is little character connection. Though the motivations behind most of the characters’ actions is simple – seeking a long-lost treasure – only a handful have enough development for audiences to care about them. But the film often makes up for its relatively simple story with a unique visual style, a seamless blend of traditional hand-drawn and computer-generated animation, even if the CG appears to be of an era further back than its ten year age. Also dating the film tremendously is the song “I’m Still Here,” supplied by John Rzeznik of the Goo Goo Dolls. Hearing his voice instantly took me back to the ’90s as it was prominently featured in the middle of the movie. This one song is a far cry from the brilliant musical numbers featured in so many of Disney’s animated films. 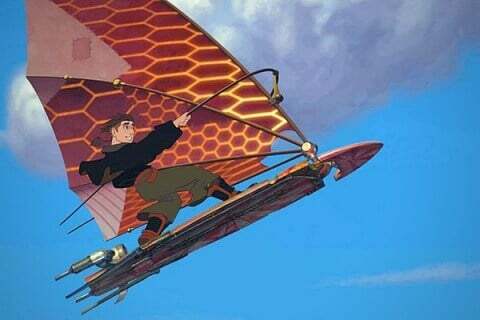 It’s been been ten years since I’d last seen “Treasure Planet,” when it first arrived in theaters. Before watching the new Blu-ray home release last night, all I really remembered about the film was something about an obnoxious robot ruining its third act. And sure enough, an over-the-top hyperactive robot voiced by Martin Short entered the picture right on cue, far too late for a new character to be introduced, especially one that ultimately proved to be fairly useless to the story. But this time around, I looked past that unnecessary character to the grander picture of the film, able to enjoy it not as an instant classic, but instead as a fun adventure through outer space with roots in (and even a direct reference to) Pirates of the Caribbean. It may not be perfect, far from Clements’ and Musker’s best work, and perhaps not worthy of its 2002 Oscar nomination for Best Animated Feature Film, but it is at least enjoyable. Despite reaching the 10th anniversary milestone, “Treasure Planet” was given little more than a sprucing up for this Blu-ray release. The film itself looks and sounds great, but no new bonus features are added for the release. There are plenty included, taking viewers behind-the-scenes into the making of each element of the movie. But they’re all presented in standard definition and are recycled from previous DVD releases. Disney fans shouldn’t immediately shrug off “Treasure Planet.” It was directed by two of Disney’s best and while it may not hold up to the standards set by so many timeless musicals, it’s an adventure that is worth seeing, and best viewed on the new Blu-ray release. 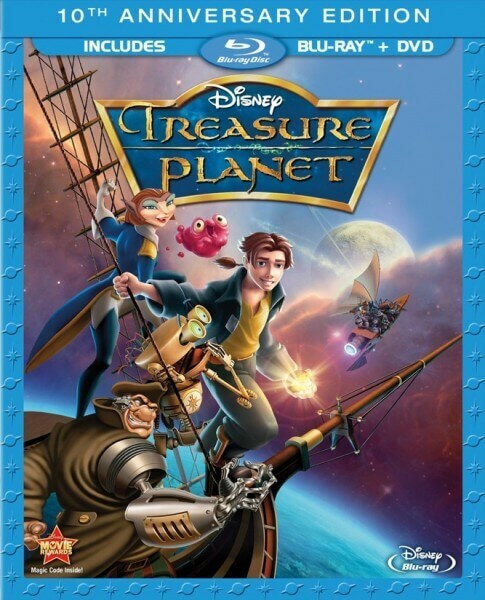 “Treasure Planet” is available now on Blu-ray via Amazon and other retailers. It’s been a good 5 years or so since I last saw it, probably when I got the DVD, but I really like Silver. I remember him being a pretty nuanced villain. My 3-year-old loves this movie, and we totally jumped on the Blu-Ray when it was released, lest the much-loved DVD nearly die. One thing that surprised me though, was even though the CGI is kind of dated, it looks a LOT more modern on the Blu-Ray than it ever has before. It really makes me wonder if they had to manually touch it up, or re-ran the effects through a more powerful machine or what. Apparently you don’t understand the concept of a review. The thoughts above are my opinion and are no less “professional” than theirs or even your own. My opinion on the Tron series (which is incredibly popular, by the way) has absolutely nothing to do with my opinion of Treasure Planet, which I did say above is an enjoyable film. It feels incredibly dated and has some serious issues in its third act, but is still enjoyable. I didn’t feel my review was harsh at all. Treasure Planet isn’t a great movie (neither is Tron) but it’s not awful either. As I stated in the end, it’s an adventure that is worth seeing, despite its flaws. Yeah, I’m also going to have to disagree with you on this. I think Treasure Planet is an underrated Disney gem that deserved a far better fate at the box office. Opening it opposite Harry Potter was its undoing (what were they thinking?! ), not the quality of the movie itself. It looks gorgeous and the CG is FAR less dated than such “classics” as The Lion King or Aladdin. As for B.E.N.? Well, I understand that criticism but, frankly, the popularity of the Genie in Aladdin caused Disney to put a similar celebrity-voiced comic relief character in every movie after (the hyenas, the gargoyles, Hades, etc.). And I can more than forgive BEN since we get John Silver and Captain Amelia, 2 fantastic characters! Perhaps my middle-of-the-road review is being misunderstood as negative. I enjoyed the film for the most part, which I stated above. But it’s not great. And no one can say it’s a Disney classic that lives up to Aladdin or The Little Mermaid. When I say Treasure Planet is dated, I mean it feels like a product of the ’90s, from the visual style to the music to the comedy to the overall feel of the film. And yet it came out in 2002. It didn’t ever lose my attention, but it never really grabbed it either. And while Silver is a solid character, I can’t say the same about Amelia, whose name I didn’t even remember by the time the credits rolled. And yet the animation and visual ambition in Treasure Planet bury both of those movies, and makes them look like the late 80’s, early-90’s rush jobs that they were. The Little Mermaid begins with an unconvincing CGI sailing ship crewed by poorly drawn characters, and the sequence ends with a sailor whose mouth falls out of sync with the soundtrack (indicating something was cut at the last minute). Aladdin’s animation is quick, fast, and toon loosey-goosey, with plenty of sloppy work excused away by the gag-a-minute 50’s WB comic tone. There’s nothing in Treasure Planet even remotely as sloppy as the work in those two films (or Beauty and the Beast, either). I remember seeing a trailer for this movie ten years ago, and when “Treasure Planet” flashed on the screen, I went “UGH.” It sounded like a weird movie. And I think most people thought that way, because I don’t remember it being a big hit. But then I saw it on the Disney Channel way back in 2006, and I really liked it! Now when I get a chance to see it I do it. I like the James Newton Howard-composed score, too. I’m a big fan of steampunk and now I think the planetary idea is pretty neat.